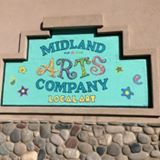 Midland Arts Company will be participating in First Friday Downtown Rifle. Come in to see what's new at our beautiful new location at the southeast corner of 3rd and Railroad. Light snacks and good company!